What is Southern Comfort? If you think it’s a whiskey as many do, you’re mistaken, but don’t feel too bad. The original formula did contain whiskey, while today it features just whiskey flavoring. The iconic brand founded in 1874 is actually a liqueur that has been a favorite of rockers like Janis Joplin. We’ve never been too partial to this sweet concoction with the great name. But something magical happens when you blend it over ice with another sweet mixer, such as Coca-Cola, Dr. Pepper or fruit juice. Somehow the sweets cancel each other out, and you’re left with a refreshing, tasty drink that is way too easy to over-indulge in on a hot day. Ironically, some of the newer versions of SoCo do contain whiskey after all! 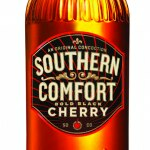 We had the pleasure of trying Southern Comfort Bold Black Cherry and Fiery Pepper. Mixing the Black Cherry with cola produced an adult version of Cherry Coke that went down smoothly and left us hankering for more. We weren’t as keen on the Fiery Pepper version, which packs some heat courtesy of Tabasco. We didn’t enjoy it straight, but once mixed, it produced a fine bite and a tangy aftertaste. These two blends are both 70 proof, but Southern Comfort products range from 30 to 100 proof, so we recommend checking the label. 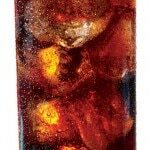 Here’s an easy but pleasing recipe for making SoCo Bold Black Cherry & Cola at home. 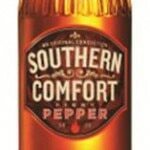 Southern Comfort Bold Black Cherry and Southern Comfort Fiery Pepper each retail for $17. Fill a glass with cubed ice. Pour in Southern Comfort Bold Black Cherry. Add Cola and garnish with lemon wedge.